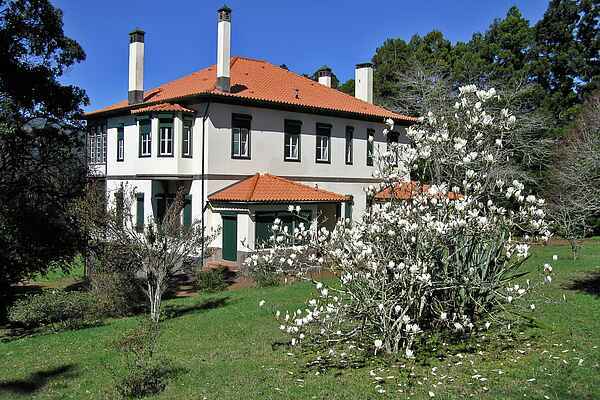 This beautiful house offers a unique holiday experience on the gorgeous island Madeira. There is much to explore and enjoy on the property and it's only a few minutes from the sea. The house is surrounded by mountains and offers a quiet and peaceful refuge for a family or group of friends looking for a special accommodation on the island. The house (PT-9100-01) is suitable for 8 adults with children, the smaller \"cottage\" (PT-9100-02) is suitable for 6 people. The houses can be booked either together or separately. This peacefully located house has a swimming pool and a large garden with a view over the mountains. Discover the property and enjoy the local flora and fauna. Also try to play the large game of cricket on the lawn! The Santo da Serra golf course, with 27 holes and part of the PGA European Tour, lies only a few minutes away. Palheiro Golf is only 20 minutes away. There are riding stables as well, next to the golf course, and the village has a beautiful park with minigolf.